Born in Brooklyn, New York to Esta (née Greenberg) and Jack Schnabel, he moved with his family to Brownsville, Texas in 1965. It was in Brownsville that he spent most of his formative years and where he took up surfing and resolved to be an artist. He received his B.F.A. at the University of Houston. After graduating, he sent an application to the Independent Study Program (ISP) at the Whitney Museum of American Art in New York. His application included slides of his work sandwiched between two pieces of bread. He was admitted into the program and studied there from 1973-1975. Painting is like breathing to me. It’s what I do all the time. Every day I make art, whether it is painting, writing or making a movie. Art critic Robert Hughes was one of the most outspoken critics of his work; he once stated that "Schnabel's work is to painting what Stallone's is to acting: a lurching display of oily pectorals." (Time Magazine, August 7, 2012). Schnabel began his film career in the 1990s with the film Basquiat, a biopic on the painter Jean-Michel Basquiat (1996), followed by Before Night Falls (2000), an adaptation of Reinaldo Arenas' autobiographical novel, which he also produced, which won the Grand Jury Prize at the Venice Film Festival. He directed The Diving Bell and the Butterfly (2007), an adaptation (with a screenplay by Ronald Harwood) of a French memoir by Jean-Dominique Bauby. The Diving Bell and the Butterfly earned him the award for best director at the 2007 Cannes Film Festival, the Golden Globe for best director, the Independent Spirit Award for best director, and a nomination for the Academy Award for Best Director. Schnabel, who designed Lou Reed's critically acclaimed 'Berlin' Tour in 2007, also released 'Berlin the Movie'. I used to go up to read to Fred Hughes, Andy Warhol’s business partner, who had multiple sclerosis. And as Fred got worse, he ended up locked inside his body. I had been thinking that I might make a movie about Fred when his nurse, Darren McCormick, gave me Bauby’s memoir, The Diving Bell and the Butterfly. Then, in 2003, when my father was dying, the script arrived from Kennedy. So it didn’t feel quite like taking on a commissioned job. In May 2017, it was reported that Schnabel would return to directing movies. Schnabel announced that he will direct a film about painter, Vincent Van Gogh during time in Arles and Auvers-sur-Oise, France. The film is called At Eternity’s Gate and script was written by Schnabel and famed French screenwriter, Jean-Claude Carrière. Schnabel said, “This is a film about painting and a painter, and their relationship to infinity. It is told by a painter. It contains what I felt were essential moments in his life, this is not the official history — it’s my version. One that I hope could make you closer to him.” Schnabel said he was struck by the painter’s “commitment to something that did not have an audience, or an audience that he was probably never going to meet. When Van Gogh looked at the beauty of nature through painting, it brought him further away from everybody and made it impossible for him to have a real life. The film will shed light on that.” The film will adopt a first-person point of view, as the isolated Van Gogh wanders the countryside, wishing a few people would commune with him like a normal person. Schnabel wants the movie to “exist outside of time,” he said. “There are moments in the script and film where he understands that nobody is going to understand him. He doesn’t care if people understand him. He just wants to be able to paint. For the longest time he was trying to help people and show people something they couldn’t see. That’s a tall order. He also realized he was going to leave something here.” Schnabel also stated that he didn’t like any of the 36 films about Van Gogh’s life. “I don’t think they get it,” he said. “Maybe I have to be a painter to be able to do this film, that’s probably why I’m doing it. I see it the way I make a painting or a work of art.” The filmmaker wants At Eternity’s Gate to make the moviegoer “feel not like you are watching Vincent Van Gogh, but you are living his life,” he said. “We’re not trying to address his whole life story. It’s really about understanding what painting is, what the different language is that is not the same. It’s a painted world, a different way of communicating.” Willem Dafoe will play Van Gogh. In September 2017, it's been reported that Oscar Isaac and Emmanuelle Seigner, who co-starred in Schnabel's The Diving Bell and the Butterfly will be part of the cast. Schnabel lives in New York, maintaining studios in New York City and in Montauk on the far eastern end of Long Island. He has three children by his first wife, clothing designer Jacqueline Beaurang: two daughters, Lola, a painter and film-maker, Stella, a poet and actress, and a son, Vito, an art dealer. In 2012, Schnabel dated May Andersen, a former model and assistant director at the Hole Gallery. Schnabel and Andersen have one son, Shooter, who was born in August 2013. Schnabel resides at 360 West 11th Street, in a former West Village horse stable that he purchased and converted for residential use, adding five luxury condominiums in the style of a Northern Italian palazzo. It is named the Palazzo Chupi, and it is easy to spot because it is painted pink. ^ a b Brown, Mick (January 19, 2008). "Julian Schnabel: Larging It". London, UK: The Daily Telegraph. Retrieved 2010-05-07. ^ Linda Yablonsky (February 11, 2008). 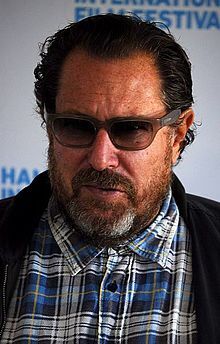 "Conversation With Julian Schnabel". ART+AUCTION. Retrieved September 21, 2016. ^ Enk, Bryan (2011-04-20). "Movie Blogs". Blog.movies.yahoo.com. Retrieved 2013-06-06. ^ "Preservation Alert - Julian Schnabel". Greenwich Village Society for Historic Preservation. Retrieved September 19, 2014.